Canada plans to seek help from the United Arab Emirates and Britain to defuse an escalating dispute with Saudi Arabia, sources said on Tuesday, but close ally the United States made clear it would not get involved. 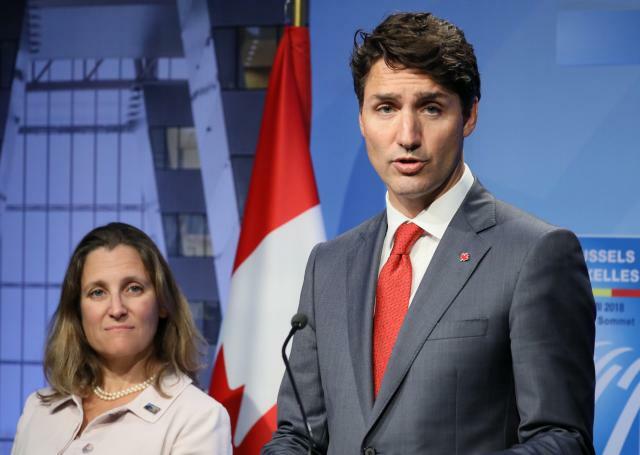 The Saudi government on Sunday recalled its ambassador to Ottawa, barred Canada’s envoy from returning and placed a ban on new trade, denouncing Canada for urging the release of jailed rights activists. Riyadh accused Ottawa on Tuesday of interfering in its internal affairs. One well placed source said the Liberal government of Prime Minister Justin Trudeau - which stresses the importance of human rights - planned to reach out to the United Arab Emirates. “The key is to work with allies and friends in the region to cool things down, which can happen quickly,” said the source, who declined to be identified because of the sensitivity of the situation. The British government on Tuesday urged the two nations to show restraint. The United States, traditionally one of Canada’s most important friends, stayed on the sidelines. U.S. President Donald Trump - who criticized Trudeau after a Group of Seven summit in June - has forged tighter ties with Riyadh. “Both sides need to diplomatically resolve this together. We can’t do it for them; they need to resolve it together,” U.S. State Department spokeswoman Heather Nauert told a briefing. Canada’s previous Conservative government, which lost power to the Liberals in 2015, also had challenges with Riyadh over human rights. Thomas Juneau, an assistant professor and Middle East expert at the University of Ottawa, said Saudi irritation at the way the General Dynamics contract was handled also helped explain Riyadh’s response. The deal was agreed in 2014 by the Conservatives, who shared the Saudi desire for deeper relations, he said. But the task of approving the export permits fell to the Liberals, who were lobbied by human rights activists to say no. The first Canadian source said Ottawa had no regrets about speaking out on human rights in Saudi Arabia. Canada’s ambassador, Dennis Horak, is not in Riyadh. The source said Saudi authorities were aware Horak was due to start a new posting next month.